Do you love coffee but can’t find the time to put a pot on? With the Tweet-a-pot you can send a tweet to your coffee pot and have it prepare you a coffee while you are still stuck in traffic. Brilliant! 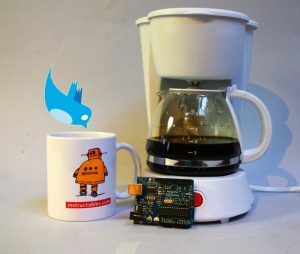 The Tweet-a-pot works by interfacing between a Computer, an Arduino board and a relay to ensure that you can control your coffee pot from anywhere in the world. The project uses python to interface between Arduino and twitter. The best thing about this project is that the same principles used to create a Tweet-a-pot can be used to control any AC device over twitter, so the possibilities are endless! From a home automation perspective this project is a great starting point. To get started with this fantastic project check out the instructable from frenzy. Check out the video below to see the Tweet-a-pot in action! If you are looking for an Arduino board to power your Tweet-a-pot, the SuperHouse team recommends the Freetronics “Eleven” Arduino Compatible Board, click on the link to find out more. Are you are thinking about making your own Tweet-a-pot or do you have a project you would like us to feature in this blog? The team at SuperHouse Automation would love to know! Tell us about it in the comments section below or on Facebook and Twitter.